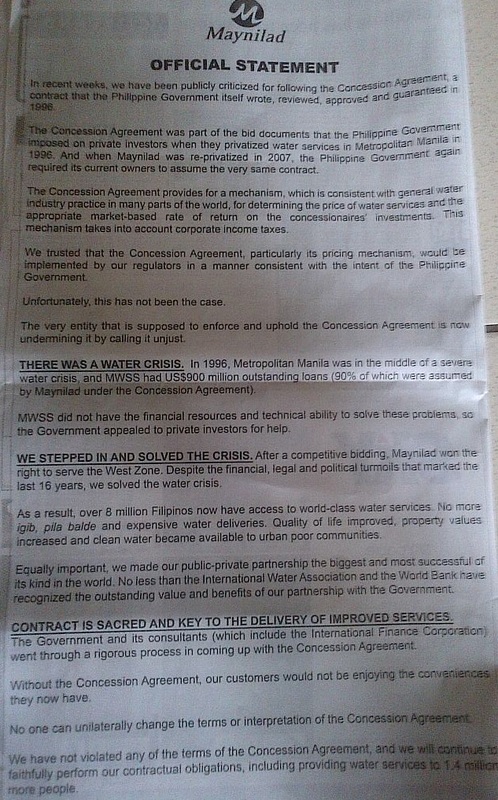 With their full-page ads (see images below) published in various newspapers defending the unscrupulous practice of passing on their income taxes to consumers, Maynilad and Manila Water unwittingly affirmed what anti-privatization advocates have been saying all along. 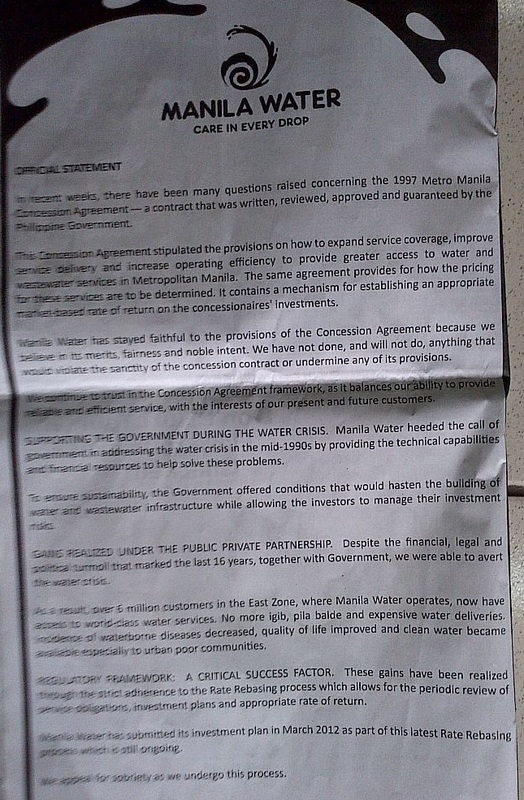 From the onset, groups like the Water for the People Network (WPN) have been arguing that the crux of the issue on exorbitant water rates is the Concession Agreement, or the privatization contract, between the Metropolitan Waterworks and Sewerage System (MWSS) and the concessionaires. This contract, a form of public-private partnership (PPP), introduced a pricing mechanism that allowed full-cost recovery and guaranteed profits for Maynilad and Manila Water, all at the expense of consumers. The concessionaires got it all wrong when they argued that the inclusion of income taxes in the determination of water rates is legitimate because it is sanctioned by the Concession Agreement. They are banking on the so-called sanctity of contracts and blatantly ignore the larger and more fundamental issue of public interest. Such posture only underscores how unjust and anti-consumer the privatization of MWSS is, and exposes the lack of public accountability of profit-driven water service providers. To recall, the WPN disclosed that the concessionaires passed on some P15.31 billion (Manila Water, P7.36 billion; Maynilad, P7.95 billion) worth of income taxes to their consumers from 2008 to 2012. The cost of future income taxes, estimated at P152.87 billion (Manila Water, P76.96 billion; Maynilad, P75.92 billion) from 2013 to 2037 (the end of the Concession Agreement) has been included as well in the monthly water bills. Maynilad and Manila Water thought that the Concession Agreement is their best defense against all the flak they have been getting. In reality, however, they just inadvertently bolstered the position of anti-privatization advocates that the long-term solution to our problem of exorbitant water rates is the termination of the Concession Agreement and the reversal of MWSS privatization. The MWSS-Regulatory Office (MWSS-RO), to which the paid ads are apparently addressed, will likely counter that, like Maynilad and Manila Water, they do respect the Concession Agreement. For the regulators, the issue is simply the proper interpretation of the privatization contract. The concessionaires, for instance, interpret Philippine business taxes referred to in the Concession Agreement as including income taxes while the MWSS-RO says otherwise. Such dispute may be resolved “legally” through arbitration proceedings (an internal dispute settlement mechanism under the Concession Agreement) or the regular courts. But even when the result of these legal processes favors the regulators, the basic issue remains unresolved – why, in the first place, are the business taxes of the private water monopolies being shouldered by the consumers? And lest we forget, while the income tax is the most controversial, it is just one of the many questionable provisions of the Concession Agreement. The rate rebasing model, for example, is onerous because it allows the concessionaires to charge the cost of future expenses to consumers. Maynilad and Manila Water pass on to consumers not only the cost of projected income tax but also the cost of future projects. Some of these projects never materialized but were paid for anyway by the consumers. Two such unimplemented projects that have charged to consumers are the P48-billion Laiban Dam and the 15 CMS Water Source Replacement projects. The Concession Agreement was designed in such a way that tariffs are regularly adjusted to ensure the financial viability of MWSS privatization. Aside from the rate rebasing every five years, the basic charge is also adjusted at the start of every year (January 1) to account for inflation, as measured by the consumer price index (CPI) for the month of July of the preceding year. It represents a double-whammy for consumers as they bear the brunt of both the inflation (rise in prices of basic goods and services, including water) and the rise in water rates due to inflation. Under the contract, the basic charge is adjusted as well every quarter to reflect fluctuations in the foreign exchange (forex) rate, which is listed in the water bill as FCDA (foreign currency differential adjustment). The FCDA is being charged to protect Maynilad and Manila Water from losses in case of sharp declines in the value of the peso against foreign currencies that could bloat the concessionaires’ foreign loans as well as the concession fees. While the FCDA could be negative, e.g. a reduction in the basic charge when the peso is stronger than other currencies (such as the announced rate reductions by the concessionaires last month), this is offset by another currency-related charge – the fixed P1 currency exchange rate adjustment (CERA). Burdening the consumers with the cost of forex fluctuations is already oppressive by itself but worse, consumers are even being double-charged for currency fluctuations with the collection of the FCDA and the fixed CERA. It is estimated that CERA collections have already reached P7.2 billion of which P3.4 billion went to Maynilad and P3.8 billion went to Manila Water. Furthermore, the private concessionaires are also allowed to collect additional fees resulting from so-called extraordinary price adjustment (EPA). The EPA protects the profits of the concessionaires by charging additional fees to the consumers to cover for the financial consequences of “unforeseen events” such as changes in national laws or regulations and force majeure events (calamities, conflict, etc. ), among others. On top of these regular and guaranteed adjustments, the concessionaires collect as well the environmental charge which is equivalent to 20% of the basic charge. Maynilad is currently collecting an environmental charge of P6.93 per cu. m. while Manila Water is imposing P5.64. With the rate rebasing, the environmental charge could go up to P6.80 per cu. m. (Manila Water) to P8.63 (Maynilad). The concessionaires explain that the environmental charge pertains to additional service charges collected from consumers for the mitigation of environmental impacts in the course of water treatment and distribution and wastewater operations. Again, imposing additional burden on consumers for the cost of something that is inherently a part of operating a water system is unreasonable. Worse, it appears that Maynilad and Manila Water are still negligent of their environmental obligations even as they impose the environmental charge. In August 2012, the Court of Appeals (CA) affirmed the P29.4-million fine imposed by the Department of Environment and Natural Resources (DENR) on MWSS, Maynilad and Manila Water for violating the Clean Water Act. To better understand why the Concession Agreement was designed in a way that assures the commercial viability and profitability of Metro Manila’s water distribution system, we need to review the rationale behind the MWSS privatization. The main impetus for the privatization of MWSS in 1997 was the agency’s huge debts incurred from the World Bank, the Asian Development Bank (ADB) and the Japan Bank for International Cooperation (JBIC). MWSS debts from the three international financial institutions (IFIs) reached around $800 million prior to privatization. Privatization was used a conditionality by these foreign lenders for new loans. Thus, the overarching goal of privatization was not to make water services more accessible and address the corruption and inefficiencies of MWSS but to ensure that the agency will not default on its debts. But Maynilad and Manila Water did not assume the responsibility of paying the debts of MWSS but will simply act as collectors from the consumers who will shoulder these debts. From these collections, the concessionaires will pay concession fees to MWSS which it will use to service its loans. Aside from raising the concession fees, Maynilad and Manila Water are also allowed to collect their profits from the consumers. The IFIs played a key role in the privatization process. The World Bank, through its investment arm International Finance Corp. (IFC), acted as government’s consultant in the project. The IFC designed the Concession Agreement that the MWSS eventually signed with Maynilad and Manila Water. Maynilad and Manila Water, by putting on the table the Concession Agreement, have upped the ante in this raging controversy on the income tax and other onerous charges. They have, in effect, challenged Malacañang to take a position on the matter of government’s contractual obligations with private investors. Indeed, the paid ads are addressed not only to the MWSS-RO but ultimately to President Aquino. The concessionaires know that what is at stake for the Aquino administration is its centerpiece PPP program where government’s commitment to fulfill its contractual obligations is key to enticing and reassuring big investors. 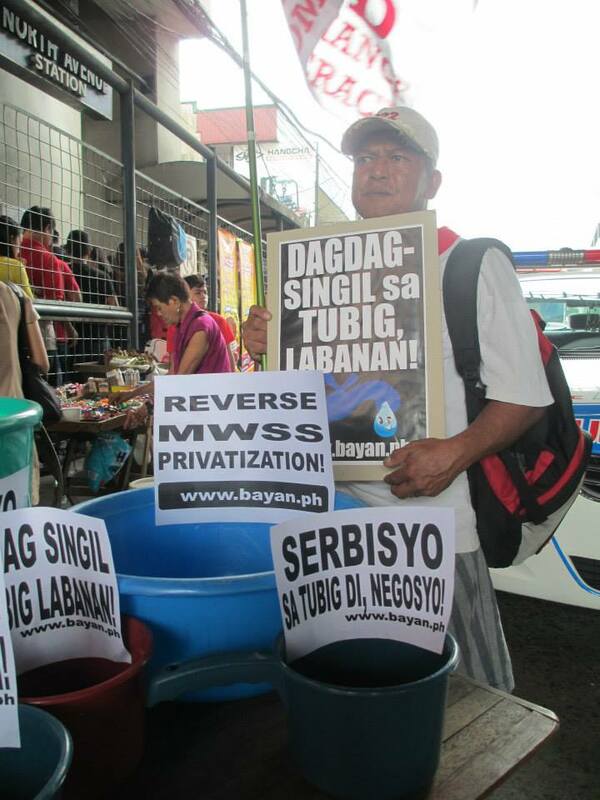 MWSS privatization, in fact, has been showcased by government to promote PPP. Also, the billionaires behind Maynilad and Manila Water, namely the group of Manny Pangilinan, the Consunjis and the Ayalas are among the huge business groups that are most active in participating in Aquino’s PPP initiative. The controversy surrounding MWSS privatization is discrediting and undermining the entire privatization program of government and further exposing the anti-people character of PPP. This is bad news for Aquino, the economic elite and foreign creditors but certainly a welcome development for the people. By the way, advertising costs are also being passed on by Maynilad and Manila Water to consumers. So we will also foot the bill of the expensive advertisements and media campaign of the concessionaires that intend to justify their abuses. Truly enraging!